Title RF diodes, switches and modulators based on 4H-SiC material. 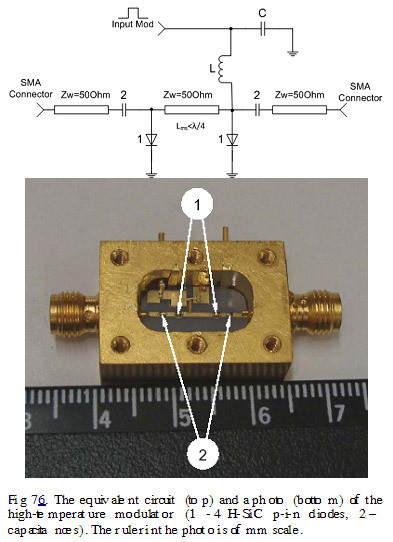 Abstract The Microelectronics Research Group in collaboration with an international consortium has built SiC PIN diodes on 4H substrates that can operate in the X-band (8-12 GHz) and tested them in broadband switches. These devices were fabricated after the epitaxial structure and device geometry had been optimized, and they make the best use of available material and existing process technology. This is the first demonstration of RF diodes, switches and modulators based on 4H-SiC material. Description P-i-n diodes are widely used as phase-shifters, switches, attenuators, and limiters in RF, ultrahigh frequency and microwave systems in devices which serve in applications ranging from civilian and military radar to mobile-phone base-station transmitters and satellite communication units. Most commercial p-i-n diodes for microwave applications are fabricated from Si and GaAs. Their technology is mature and thus, their performance in terms of power and switching speed is limited by the physical properties of these semiconductors. Si-based p-i-n diodes are more versatile in terms of performances, however, the modulators with short switching times (within 1-10 ns) are not able to commutate high microwave power. Moreover, the working temperatures of silicon and GaAs based p-i-n diodes do not exceed 175oC. SiC could enable higher switching speeds and similar microwave-power-control capabilities, provide greater power handling at equivalent switching speeds and also cut the number of devices required in a circuit. When SiC p-i-n diodes are used, only one or two diodes would be needed to handle a few kilowatts of RF power, leading to a simpler, broadband circuit that is easier to cool. Moreover, SiC has a thermal conductivity about five times higher and may operate at temperatures at least four times higher than silicon. Therefore, a SiC p-i-n diode could dissipate substantially higher thermal power than a similar Si diode. To speed up SiC PIN development, the Microelectronics Research Group formed a consortium which has built SiC PIN diodes on 4H substrates that can operate in the X-band (8-12 GHz) and tested them in broadband switches. These devices were fabricated after the epitaxial structure and device geometry had been optimized, and they make the best use of available material and existing process technology. The 4H-SiC diodes produced excellent DC characteristics and fast switching. Capacitance at a punch-through voltage of -100 V was well below 0.5 pF for mesa structures with a diameter of up to 150 μm, which shows that this structure has the potential to operate at high frequencies. Over a narrow band between 8.5 and 10.5 GHz, the developed SPST switches produced an isolation of 19-25 dB and insertion loss of less than 2 dB. The stability of the switches' electrical characteristics is excellent, according to extensive high-thermal-stress tests that were conducted over long periods. High-power tests at 9.5 GHz on 100 μm diameter diodes have also been carried out to determine the power-handling capabilities. In the "off" configuration the switches produced a very stable isolation of 22.5 dB at microwave powers of 2 kW, and in the "on" state the devices delivered an insertion loss below 1 dB for powers up to 1.8 kW. The isolation and broadband operation of the switches has been improved by building two types of modulator featuring multiple diodes. The three-diode modulator is a compact and convenient design for portable communication systems, while the version containing two diodes is suitable for high-temperature operation. The three-diode package produces 30 dB isolation, an insertion loss below 2 dB and switching in less than 30 ns in the 1-6 GHz band. Its two-diode counterpart produced a transmission loss of just 1-2.5 dB and isolation of 33-45 dB between 2-7 GHz at temperatures up to 300oC. The peak value for the isolation actually increases with temperature, proving for the first time the suitability of SiC PINs operating at high temperature for high-frequency applications. The behavior of these PIN circuits under high-power CW and pulsed-signal operation is still under investigation. P-i-n diodes are widely used as phase-shifters, switches, attenuators, and limiters in RF, ultrahigh frequency and microwave systems. These devices (which serve in applications ranging from civilian and military radar to mobile-phone base-station transmitters and satellite communication units) are preferred to their electromechanical equivalents because they are cheaper, more reliable, last longer, and can operate at higher speeds. They are also more efficient, as they can operate at very high microwave power levels using a low direct-current (DC) bias. Type of collaboration sought Industries or research labs specialized in the development of RF systems using microwave p-i-n diodes for technical collaboration. High power applications are mostly targeted.